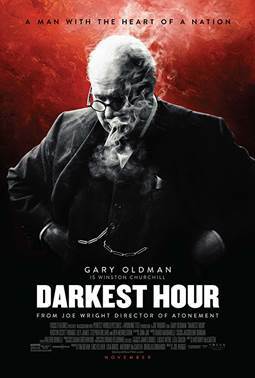 At the onset of World War II the fate of Western Europe would come down to the decisions and negotiations of the newly appointed Prime Minister, Winston Churchill (Gary Oldman), this is a recounting of the moments that would ultimately lead to the world standing up against Hitler. Directed by Joe Wright this political procedural offers up a fantastic and nuanced ensemble performance including the work of Lily James, Kristin Scott Thomas, and Ben Mendelsohn with Oldman as the Keystone. Further attention to detail comes from the cinematic eye of Bruno Delbonnel and editing styling of Valerio Bonelli to accurately capture the claustrophobic feel and thick air surrounding the events of the time. No doubt some liberties have been taken with the story for the sake of the big screen, still, Writer Anthony McCarten ties together the pivotal points succinctly, making for yet another glimpse into British history sitting with the company and likes of this year’s Dunkirk, and hearkens back to elements of The King’s Speech of 2010, pretty good company. Worth your while, Darkest Hour is rated PG-13. 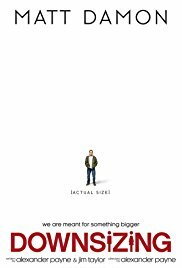 Beginning to feel the rat race wear him down, wanting to make a bold change for his wife, and looking to better the planet at the same time, middle aged Paul Safranek (Matt Damon) decides to go through the scientific process of “Downsizing” — a breakthrough procedure that reduces the mass and size of living things to a tiny fraction of their original size. Initially motivated and driven by self centered reasoning Paul’s worldview and outlook all changes when he meets humanitarian, Ngoc Lan Tran (Hong Chau), this is his story. Directed and Co-written by Alexander Payne, this jam packed satire crams a ton of social commentary into its two hour and fifteen minute body in almost the “kitchen sink” approach of storytelling; an ambitious undertaking that feels too broad in scope. Moving from comedic tones to political subtext and commentary, Payne clearly has something to say but lacks the breviloquence to get that message out in a completely efficient manner. Supported by a cast of thoroughly entertaining talents including Christoph Waltz and Kristen Wiig, Downsizing certainly does manage to engage the grey matter of the viewer, at the very least prompting the questions “Would you ever consider being downsized? Why? And, why is it important?” Chuckle worthy, but really falling in to the category of rental, Downsizing in effect overstays its welcome and perhaps could benefit from a downsizing of its own to make for a stronger film? Downsizing is rated R.